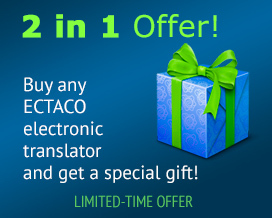 Ectaco - Unlimited linguistic resources for all of your needs. Over 200 languages available. You may also choose to pay for your order using an alternative payment method including checks, postal money orders, bank transfers, PayPal, Moneybooker, Google checkout, etc. Our representatives will contact you with further instructions after you submit your online order. So that our letters do not end up in your spam folder please create a filter for the Ectaco.com domain (or add us to your whitelist). Get 50% off the regular price! Learn more while you play! The most effective and enjoyable way to build your vocabulary ever invented now includes more than 8000 words! LingvoSoft FlashCards English <-> Spanish for Windows Mobile is part of LingvoSoft Suite - the complete language solution available only from LingvoSoft. Now it is simpler than ever before to improve your vocabulary and learn thousands of new words no matter where you are – at home, at school, or even at work. FlashCards make learning fun and let you use any free time to build your language skills and increase confidence. 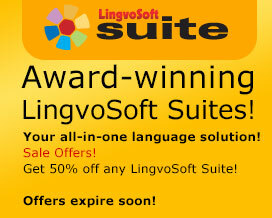 LingvoSoft FlashCards English <-> Russian for Windows Mobile is part of LingvoSoft Suite - the complete language solution available only from LingvoSoft. Now it is simpler than ever before to improve your vocabulary and learn thousands of new words no matter where you are – at home, at school, or even at work. FlashCards make learning fun and let you use any free time to build your language skills and increase confidence. LingvoSoft FlashCards English <-> Chinese Mandarin Simplified for Windows Mobile is part of LingvoSoft Suite - the complete language solution available only from LingvoSoft. Now it is simpler than ever before to improve your vocabulary and learn thousands of new words no matter where you are – at home, at school, or even at work. FlashCards make learning fun and let you use any free time to build your language skills and increase confidence. LingvoSoft FlashCards English <-> Japanese Kanji Romaji for Windows Mobile is part of LingvoSoft Suite - the complete language solution available only from LingvoSoft. Now it is simpler than ever before to improve your vocabulary and learn thousands of new words no matter where you are – at home, at school, or even at work. FlashCards make learning fun and let you use any free time to build your language skills and increase confidence. LingvoSoft FlashCards English <-> Arabic for Windows Mobile is part of LingvoSoft Suite - the complete language solution available only from LingvoSoft. Now it is simpler than ever before to improve your vocabulary and learn thousands of new words no matter where you are – at home, at school, or even at work. FlashCards make learning fun and let you use any free time to build your language skills and increase confidence. LingvoSoft FlashCards English <-> French for Windows Mobile is part of LingvoSoft Suite - the complete language solution available only from LingvoSoft. Now it is simpler than ever before to improve your vocabulary and learn thousands of new words no matter where you are – at home, at school, or even at work. FlashCards make learning fun and let you use any free time to build your language skills and increase confidence. LingvoSoft FlashCards English <-> German for Windows Mobile is part of LingvoSoft Suite - the complete language solution available only from LingvoSoft. Now it is simpler than ever before to improve your vocabulary and learn thousands of new words no matter where you are – at home, at school, or even at work. FlashCards make learning fun and let you use any free time to build your language skills and increase confidence. LingvoSoft FlashCards English <-> Italian for Windows Mobile is part of LingvoSoft Suite - the complete language solution available only from LingvoSoft. Now it is simpler than ever before to improve your vocabulary and learn thousands of new words no matter where you are – at home, at school, or even at work. FlashCards make learning fun and let you use any free time to build your language skills and increase confidence. LingvoSoft FlashCards English <-> Polish for Windows Mobile is part of LingvoSoft Suite - the complete language solution available only from LingvoSoft. Now it is simpler than ever before to improve your vocabulary and learn thousands of new words no matter where you are – at home, at school, or even at work. FlashCards make learning fun and let you use any free time to build your language skills and increase confidence. LingvoSoft FlashCards English <-> Portuguese for Windows Mobile is part of LingvoSoft Suite - the complete language solution available only from LingvoSoft. Now it is simpler than ever before to improve your vocabulary and learn thousands of new words no matter where you are – at home, at school, or even at work. FlashCards make learning fun and let you use any free time to build your language skills and increase confidence.